For those who know him, it might come as no surprise just how long it took David Mann to give his publishers a book. Mann, founder and head of New York’s MR Architecture and Décor, (a firm known for straddling the line between both disciplines, and a perennial fixture on AD’s top 100), wanted to use the retrospective as an opportunity for improvement. He wanted his team to assess the work they had done, to discover just what it was they were proud of, and to decide how they could bring these elements to bear on their projects in the future. This deliberate, conscientious thinking, coupled with a certain modesty and collaborative spirit, are exactly what have distinguished MR’s projects to date. These are the qualities that have delivered the firm consistently intelligent, beautiful, and remarkable results, and they are the influence of the firm’s chief, David Mann. 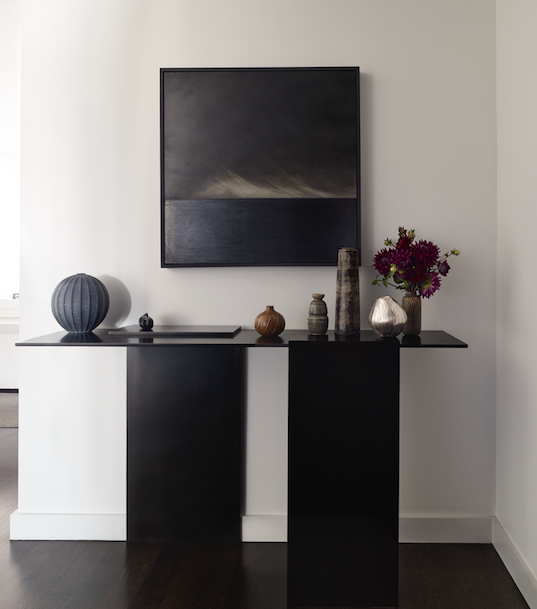 David Mann’s work, which is mostly centered in New York, has nonetheless taken him as far afield as Montana and has provided him the opportunity (as the architect might himself modestly phrase it) to work with a wide variety of people—from clients for whom Mann has contributed his own pieces (mostly furniture, but in one case, at least, a painting) to Susan Weber, famed decorative arts specialist, philanthropist, and collector, who supplied the introduction for his book. What’s more, he wears nothing, it seems, but his signature black Prada suits, is a strong advocate for the environment, and could not be happier that his employees bring their dogs to work (despite the Sisyphean task of rolling his suits clean of their hair). 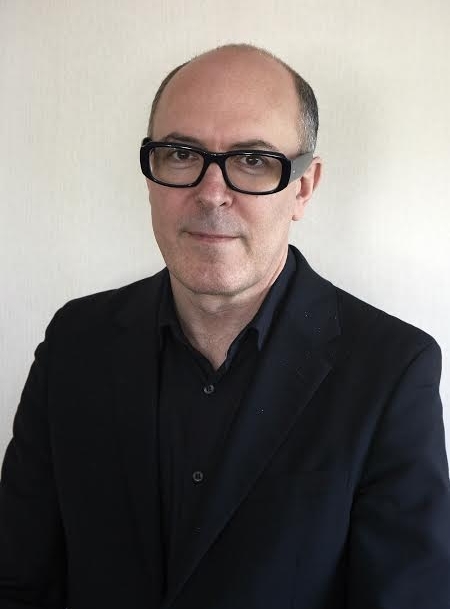 We caught up with David Mann at his firm’s offices earlier this month—here’s what else he had to say. What’s more, he wears nothing, it seems, but his signature black Prada suits, is a strong advocate for the environment, and could not be happier that his employees bring their dogs to work (despite the Sisyphean task of rolling his Prada suits clean of their hair). You talk about your first apartment pretty extensively. As one of your first projects in this book you mention how deliberately you changed the space. Did that process influence your work as a designer? I think so. That is very much why that story is featured first in the book. First of all, it’s a very small, very modest kind of project and it set the values—it set my internal values—for how I thought about things and how I personally approach a project, and even this idea of a book about the collaborations I’ve had. So my very first collaboration was with myself—understanding what it is I wanted and understanding how I wanted to approach a project. And it had to do with having a deep understanding of what the real issues are, and needs are, no matter how simple or how small a project is. So that’s what you’d say you bring to a collaborative project? I think so. Because a lot of our projects are in New York there is always a need for more space. And understanding this idea about how to be incredibly efficient and affective with space grew out of that apartment. One of the things, I think, that is true about that project, even looking at it now, is that there’s something a little eccentric about it at the same time. The choices aren’t everybody else’s choices on how to live in a place like that. Your more typical approach might be to have a sofa that’s convertible and to have a table that is folding and do things like that so you sort of pack everything in there. And my approach was, no, I want fewer things but I want them to be luxurious and over the top. What about collaboration do you find most difficult? I think, actually, if you come to the realization that some people are really not on the same plane as you, don’t have the same values as you, that that can be difficult. I like to focus on the opposite – the really rewarding ones where together with someone you create something really special. You can have a talented person but unless you get the project you don’t get something really happening. It really is an alchemy that occurs—that’s what’s exciting, when it all comes together, when you have someone who is open, interesting, and trusting but also inspiring in their own point of view and you work together to create something wonderful. See that’s the interesting thing—to me style is never the question. For the most part there are good examples in almost any style that I love. She of course always has the best of everything. To me it’s not about style—modern, traditional, classic, art deco—it’s really about a personal approach. It’s about creating something with great quality, character, uniqueness, and telling a story. That’s what’s rewarding about doing what we do. One thing about Susan that’s different from me, is she loves collecting—I come at things much more highly edited. There’s a very different approach, but I have ultimate respect for her because I think she’s one of the foremost authorities in her field. I think so. Because a lot of our projects are in New York there is always a need for more space. And understanding this idea about how to be incredibly efficient and affective with space grew out of that apartment. One of the things, I think, that is true about that project, even looking at it now, is that there’s something a little eccentric about it at the same time. The choices aren’t everybody else’s choices on how to live in a place like that. Your more typical approach might be to have a sofa that’s convertible and to have a table that is folding and do things like that so you sort of pack everything in there. And my approach was: no, I want fewer things but I want them to be luxurious and over the top. I think, actually, if you come to the realization that some people are really not on the same plane as you, don’t have the same values as you, then that can be difficult. I like to focus on the opposite – the really rewarding ones where together with someone you create something really special. You can have a talented person, but unless you get the project you don’t get something really happening. It really is an alchemy that occurs—that’s what’s exciting, when it all comes together, when you have someone who is open, interesting, and trusting but also inspiring in their own point of view and you work together to create something wonderful. When you look at the book, how do you feel? The first thing to do is to explain maybe the reason we did the book. Technically I think what happens is that once you get on the AD 100 list every publisher comes at you wanting to do a book. So I was getting these offers and it made me start to think about it, and I decided that the thing that would be of value here would be to really take a good, hard look at the work we’ve done so far, figure out what it is that is of value to us and use that to figure out what we do going forward. Now that’s really what this book is about. It was really spending a lot of time and effort and figuring out what are the best projects that we’ve done, why, and what that means to us in terms of how we work from this point on. In the book you mention that you’ve moved. Why did you leave the Village? Was it a matter of developing needs? The main thing for me was to have my own closet, so we got a bigger apartment. I also thought, “Okay I had 25 years at the old place.” It was great, I loved that apartment. But I was young when I moved in and we had lots of wild parties, (laughs). Now we have tamer parties–dinner parties. Well I personally have always wanted to be an architect. There never really seemed to be another option. What was strange about it was that it came out of left field, considering nobody in my family was an architect. I was raised in Phoenix where there are a lot of Frank Lloyd Wright homes and Frank Lloyd Wright inspired homes so I think there were a lot of examples of good architecture growing up. Over time I went to college for architecture and I graduated and went to architecture firms and then started this firm. How did your family take to it when you first told them this was what you wanted to do? It’s funny, my father was a doctor and he had 13 uncles that were all in the same field. His brother was a doctor. But my brother and I–neither one of us wanted to be doctors. He was very supportive of whatever we wanted to do. Was it Frank Lloyd Wright’s influence that got you into design as well? On your website, especially, you don’t seem to draw a distinction between interior design and architecture; you seem to see them as a unit. Yes I do feel that way. 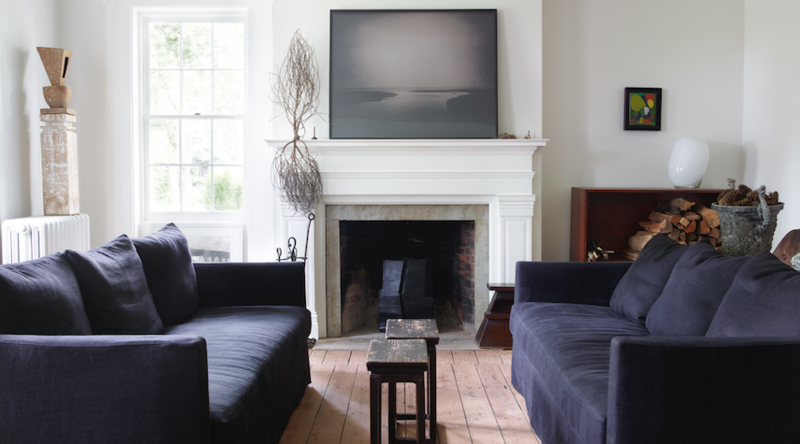 Working in New York I think, for one thing, there’s a lot more interior work available and I kind of naturally fell into originally working for decorating firms and then working also with architecture firms. I was always a little baffled at the prejudice of one group towards the other. I don't quite understand what that’s about. And I think for whatever reason I personally felt very adept and comfortable at both ends of the spectrum. How do you think New York affects what you do? It’s molded me for sure. I came here as a young kid, and I see the city has created me more than anything else. As a person and a professional it seeps into the core. Would you ever leave Manhattan? Maybe. I’ve been living in New York City since 1975, that’s 42 years. I still maintain some friendships from then, but I can only think of a few that are still here. Most of them have sold their places and moved on. I have a house upstate, and I do like being up there – I’d like to spend more time there. But for the moment I’m pretty engaged in what’s going on here. Do you think it takes a certain type of person to stay in New York? When I was younger I used to think, “Oh this is the best place to be old. You’ve got museums and you can sit on the sidewalk and watch the people go by.” But what’s happened is that the city has changed so much, it’s not so much this creative, wonderful place. When I was younger it was all these crazy artists doing these crazy wild things. I have a feeling they’ve moved to different places now. And that’s the sad difference. 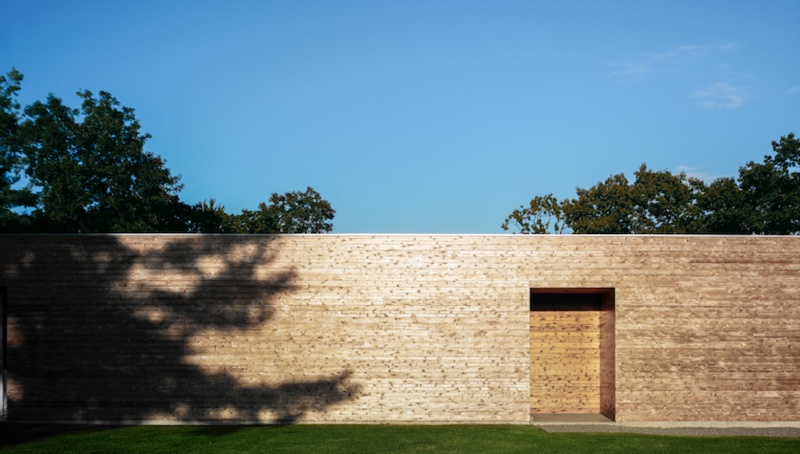 How do you look at a space in the countryside? In the book, you mention a cabin in Montana that’s featured—how do you approach that? The client sometimes gives us direction that we follow closely. In this case, the client had a very large ranch. He had bought, I think, eight disassembled cabins from all over the country. So he had all the components piled up on the property. He said, “Using this, create something for me.” So we created a little village, a cluster of structures that gave what we thought was an air conditioned, kitchen-ed and bathroom-ed, real experience (laughs). So, you spent a lot of time out there? I was going out to Montana a lot, and I had never been there. It’s beautiful, the land is extraordinary. 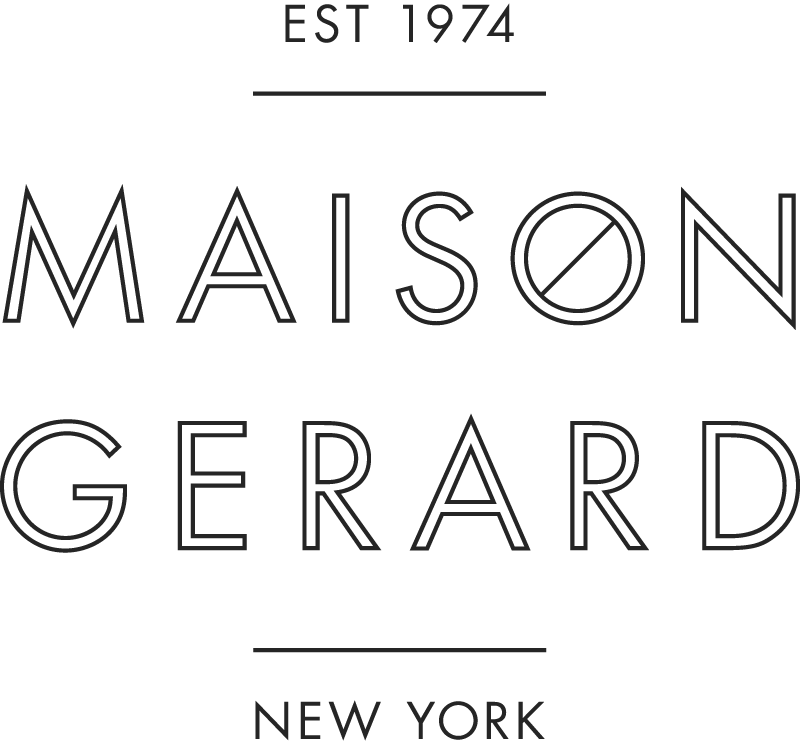 What do you like about Maison Gerard? The easy answer is Benoist (laughs). I think he is a–he is a devilish genius. I don’t know anyone out there who grasps 20th century furniture as well as contemporary furniture and knows how to pit both of those against each other so well to create one full vision. There’s nobody who does that as well he does, and I think that’s very much in keeping with the way we see things, where again it’s not about style—it’s about how interesting, or how much quality there is in it. He has an imagination that knows no bounds and he’s fearless when it comes to taking his industry in a direction that’s special. Yes, they tend to be on the smaller scale. I don’t know who’s here today but there are usually two or three little dogs running around the office. And the miraculous thing is, I haven’t come across a client yet that has said that “you can’t have your dogs out while we’re here.” Most of our clients love dogs. I always ask, if you weren’t doing this job what do you think you’d be doing? MR Architecture + Decor (Abrams; April 11, 2017; U.S. $60.00; Hardcover), the first monograph on the firm, features eighteen projects, with more than two hundred photographs of some of their most gorgeous residential work.